So you are saying that summer is nearly here, so why do you need to worry about ski resorts? Check out and bookmark for future reference our Global Travel new top 3 ski resorts in the world. First is Aspen in Colorado. If you are looking for a place to ski with the rich and famous, then this is the place you want to be. This is a place that has terrain for all ski levels and has some of the best accommodations that you are ever going to find at a ski resort (great hotels - Sky Hotel, Hyatt Grand). Although this is a place that is a bit expensive, it is well worth every penny that you pay. 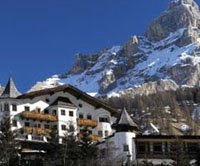 Next head over to San Cassiano and stay at Rosa Alpina or Dolomiti Wellness Hotel situated in Italy. This is one of the world's first ski resorts and it is still going strong. The area does have a very stylish feel to it, and this is what a lot of people want when shelling out money to go on a ski trip. However, if you are looking for the best snow and best slopes, then you can not go wrong here either. That is because these slopes served as host for the 1956 Olympic Games. That gives you an idea of just how great this place is. Last, but not least, head on over to Mont Tremblant, Quebec. During the winter there is no place in the world that has better snow and better slopes than Canada. This is a skier's paradise, and it has been since back in 1939. If you are lucky, you will still find some snow in these resorts, so grab your ski gear and enjoy the slopes! I am sorry to say but this post is poor! Have you ever hear about the french Alps? Try a trip next winter there and you'll see that your top 3 ski resorts in the world will change! Thank you for this post. It's great to know the top 3 ski spots in the world. I'll be sure to pass this on the my readers. I have been reading your blog for a while, I find it interesting. I have never been to the ski resorts you recommend simply because I can't ski. :) But hope to learn it one day and hit the slopes.